People need people. I know, that sounded very Babara Streisand-ish, but it's very true. Hermits are an anomaly. Mountain men were just plum crazy after a season or two trapping in the mountains without human contact. Their horse was their best friend, and they talked to it all the time. Not the best therapy for good mental health, but it worked. One sided conversations are one way to combat loneliness. In the movie "Castaway", Tom Hanks's character adopted a volleyball as his buddy. 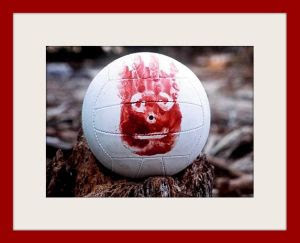 "Wilson", the name the ball was born with and was stamped on its skin, was an important tool for Hanks to keep his sanity on that island for all that time. He talked to it, and shared with it. It worked to a degree, if you think talking to a volleyball is sane. People, regardless of who they are, or their circumstances, need the interaction of others. Some may need it only once or twice a year as with the hermit that comes to town for supplies, others, like me, enjoy it more frequently. This is why humans have taken the act of pairing up so seriously. From the earliest times, humans have found themselves becoming connected to another, for a variety of reasons. In the beginning, it was probably a specific skill set that attracted the other. One could hunt well, the other could do something with the thing that was hunted. Later on, one could grow things, and raise livestock fairly well, and the other could help, and do stuff with the things they grew and raised. If the partners were male and female, then making babies was something that came naturally as well. So, some partners would have the skills to do something with the meat brought home by the other, help out in the garden and with the animals, and do something with whatever they produced, and as a bonus, they could replicate themselves. The other partner, while being true to their skills and work demanded of them, would be lost while the other carried, delivered, and cared for a baby. That is when the nap was invented. It is instinctive. It's in our genetic code, and it is something that one doesn't mess with. Women can breast feed, men can nap. Our Maker is very wise. Besides naps, there were other things that came from these mutual relationships. Companionship was high on the list. Instead of talking to a volleyball, they had each other to share their day with, express their feelings to, and argue with. Human nature being what it is, soon let emotions to augment the needs the partners had for each other. They felt good when the other was around, and missed them when they were away. They cared for each other, and soon that caring and good feelings grew into that "little thing called love". This pairing of people has been with us since we first walked around alone talking to ourselves, and someone answered back. Whether we pair up as best friends, partners, or mates, our heads need that contact with another on a personal level. Sometimes those partnerships dissolve for a variety of reasons. Usually, it is due to other human emotions that get the best of us, or back in the day, when a tiger or a barbarian ran off with our other half. The latter was always a bummer, and when it happens today, we still get upset. There are those of us that are blessed enough to have another face to greet us in the morning, and at the end of the day. To listen to us babble on about nonsense, and rant about more nonsense. To share in our excitement when we do something neat, and to tell us they love us out of the blue. To be there when we hurt, and to hug us when we're down, and to love us everyday, no matter what. I'm one of the blessed. And to think, it all started with my talking to myself, and her answering back.